Kargil war hero, late Captain Vikram Batra’s short 24 years of life are a personified testament to the spirit of the Indian Army. As fiery in his enthusiasm and courage as army call name “Sher Shah”, Batra was martyred on July 7, 1999, during combat. Five weeks after the Kargil war began, on June 19, 1999, Lieutenant (at the time) Batra was ordered to recapture Point 5140. In spite of the enemy camp at the Point with a height advantage on them, Batra and his men successfully made it to the top alive in a decisive victory. Following the successful capture of Point 5140, which strengthened India’s hold on the territory and led to the fall of Tiger Hill, Batra is known to have told his commander at the base — “Ye Dil Maange More” — using a popular advertising slogan of the times to express his desire to do more. Next, the eighty degree steep and 17000 feet high Point 4875 — one of the most difficult mountain warfare operations — was undertaken by Batra and his men. At the height of 16000 feet of it, Pakistani troops were stationed. 18 years ago, on the night of July 7, as Batra and his men advanced, the weather conditions with fog too were unfavorable to their mission. Batra was heavily wounded while rescuing another injured officer during an enemy counterattack but fought till his last breath despite grave injuries. By the morning of July 8, India had annihilated the enemy side and recaptured Point 4875 but lost Captain Batra. “I’ll either come back after raising the Indian flag in victory or return wrapped in it, but I will come for sure,” he had said and it rang true on that day of mourning. Captain Batra was posthumously awarded the Param Vir Chakra on January 26, 2000 and till date he is the last soldier whose achievements have been immortalised with India’s highest military honor. 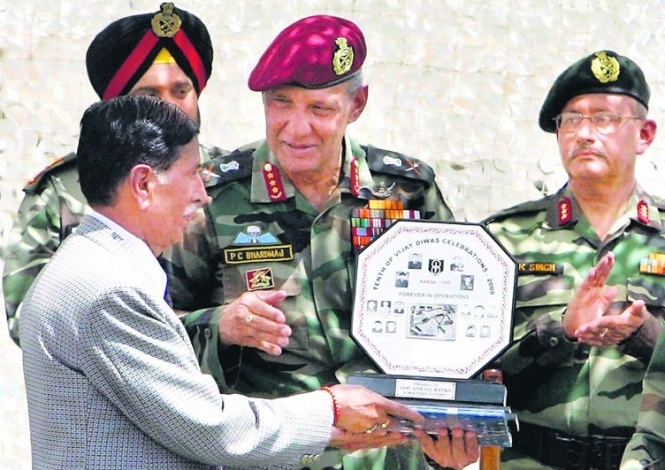 Since then, many army cantonments and edifices bear his name such as a hall at Service Selection Centre Allahabad is named ‘Vikram Batra Block’, a residential area in the Jabalpur Cantonment is called ‘Captain Vikram Batra Enclave’ and the combined cadet’s mess at the Indian Military Academy, is named ‘Vikram Batra Mess’. His towering legacy of selflessness and fearlessness continually serves as an inspiration for the young people who aspire to join the Indian Army.